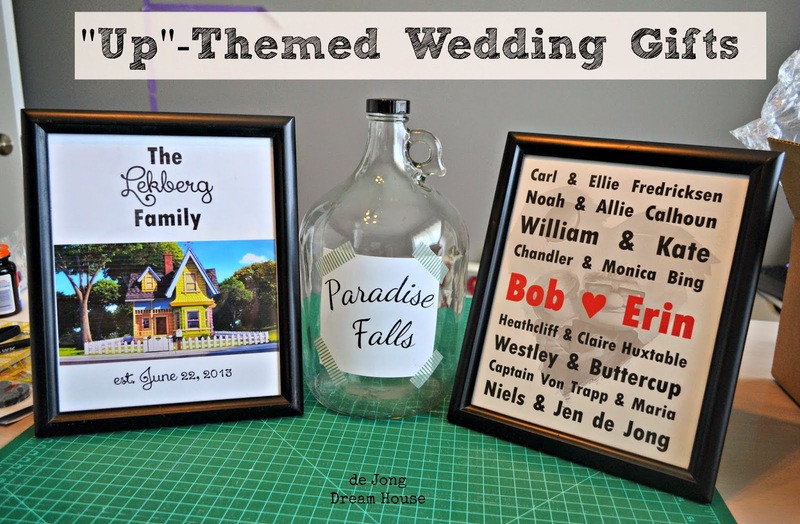 Last summer, I posted about the "UP"-themed wedding gifts I made for my friends, Bob and Erin, in honor of their "UP"-themed engagement and wedding. 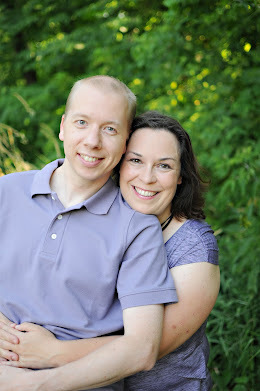 Erin and I have been friends since my days in Michigan, where she and I grew closer after my brain injury. When I was dating, Erin would happen to stop by wherever my date and I met up to check up on me. In fact, on the first weekend Niels and I met, Erin joined us at an improv show. During the intermission, she leaned over and asked me what I thought of Niels, because if I didn't want him, she did! That was just the nudge I needed to get over my commitment fears! Erin and I were alike in our high regard for marriage and high standard for the men we were hoping to marry. 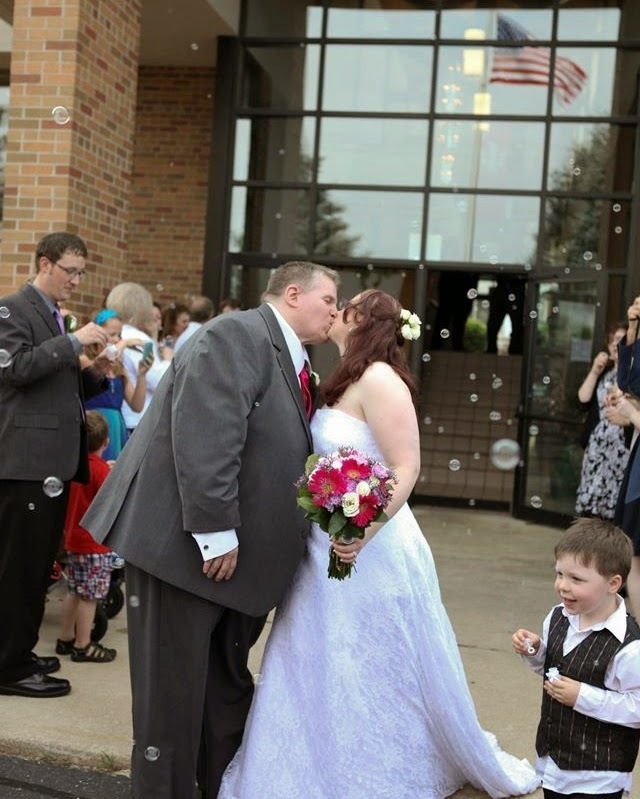 Two years ago, Erin met Bob and they quickly fell madly, almost ridiculously, in love. 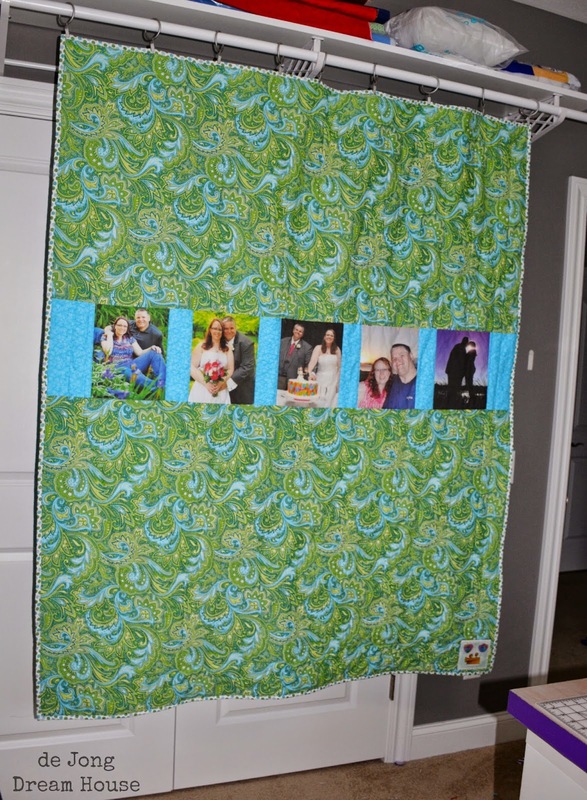 At the time of their wedding, I had been been quilting for only four months, and had just finished my third simple quilt. I wanted to make them a quilt, but I also wanted to make sure I had a few more quilts under my belt before I made theirs. 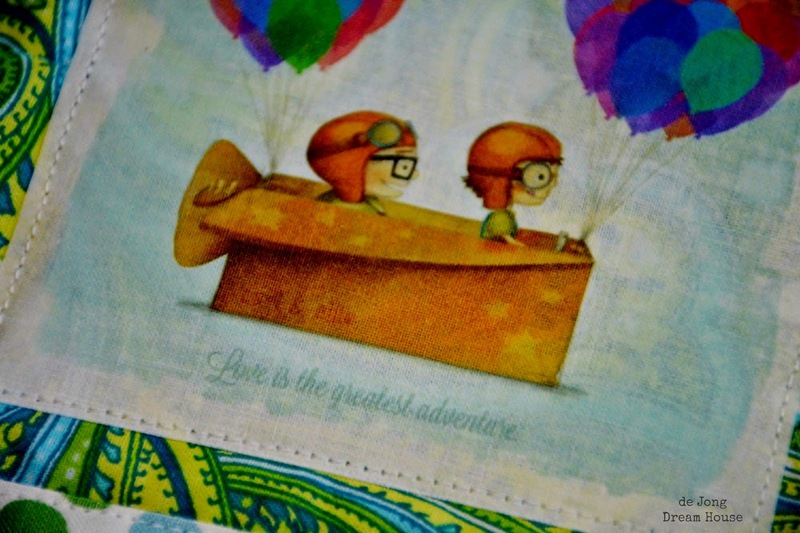 I gave them the gifts pictured above and promised them a quilt for their first anniversary. Although I did manage to figure out how to make the quilt I had in mind for them by their first anniverary, when it was done I thought it was better suited for a girl, So with their permission, I gifted it to a sweet little girl who has being fostered by friends of mine, and promised them a quilt for their second anniversary. 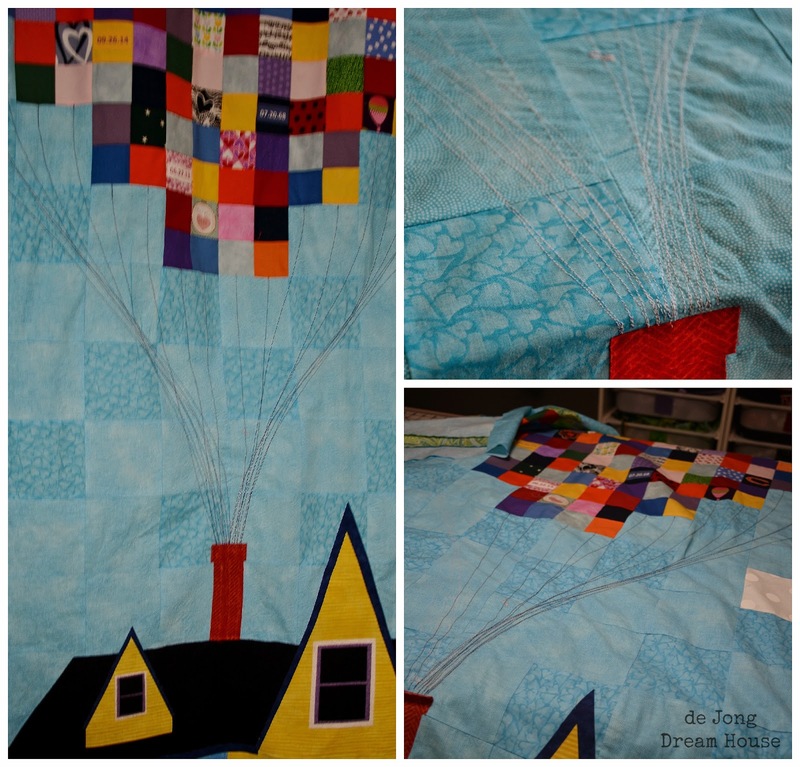 As we talked about what kind of quilt I should make for them, they suggested an "UP" quilt. I was pretty intimidated by the prospect, and mulled it over for months. 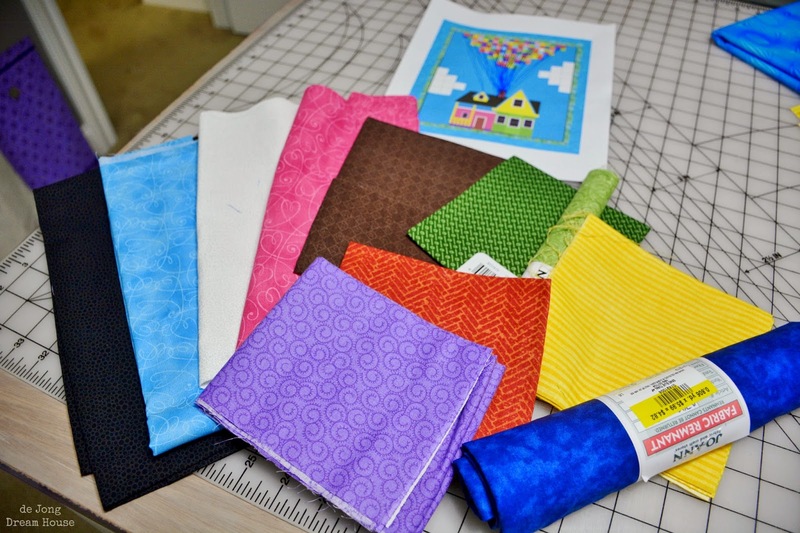 I started sketching some ideas and collecting fabric and slowly, the UP quilt was moving up in my to-do queue. Tragically, Bob died of a heart attack on September 20. 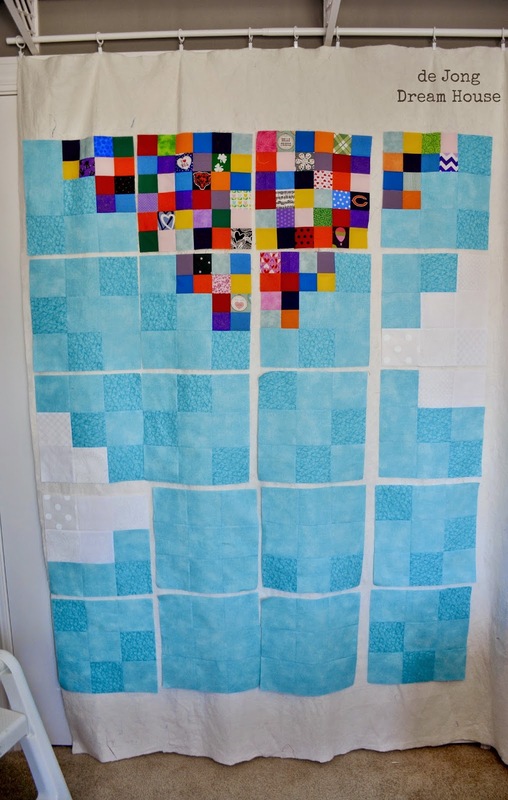 My heart was broken for my friend and I was determined to finished their quilt. Fortunately, I had been thinking about this quilt for more than a year so I had the template ready, fabrics collected, and had been learning to applique, I had found inspiration for the background in an eBay quilt, I have made several digital-type quilts, so the idea of making the balloons out of squares appealed to me. I used two very similar blue fabric for the background, and five different whites for the clouds. For the balloon squares, I used twelve different solid colors, plus thirty-one special balloons, many of which held special meaning to Bob and Erin. 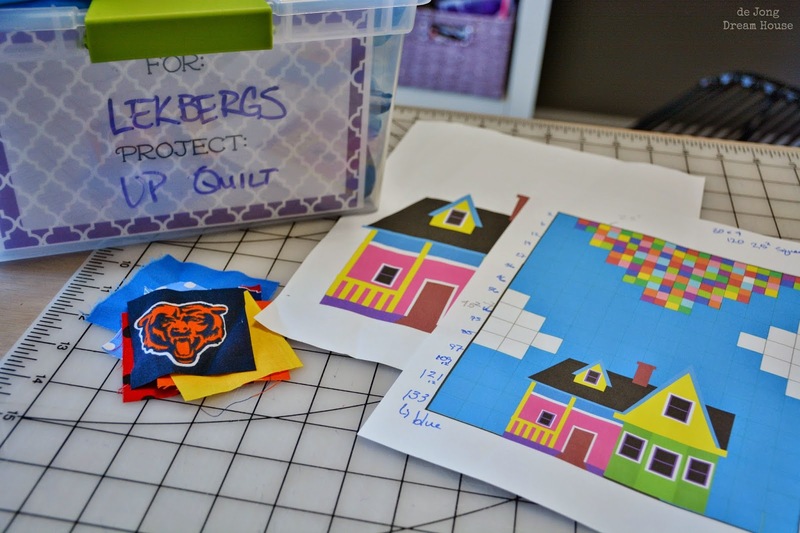 Bob had teased me, as a Minnesota Viking fan, that he wanted his quilt to have Chicago Bears fabric in it. He got his wish. The background came together very quickly. 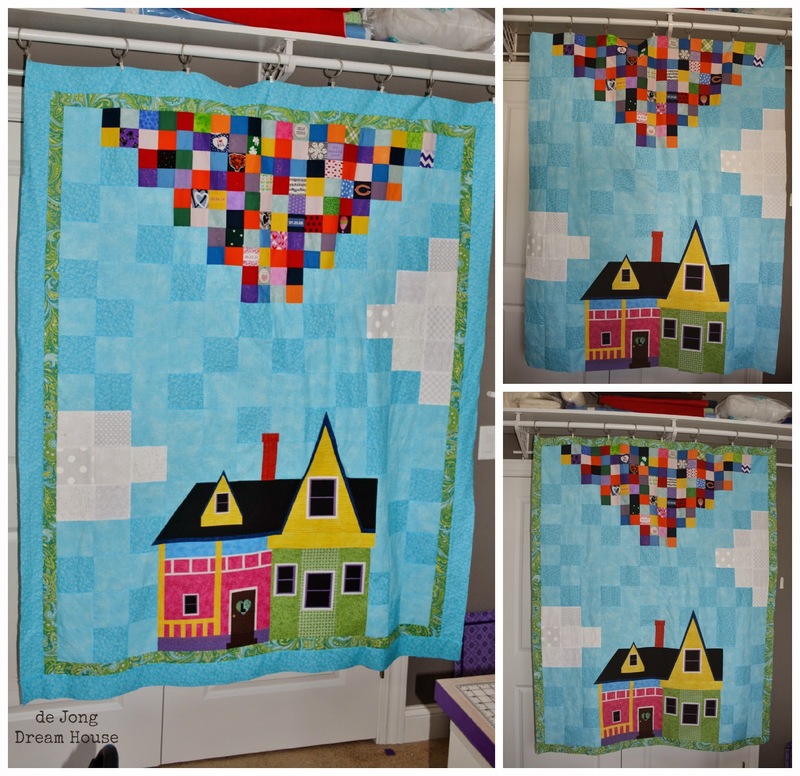 I made nine patches out of the squares, taking some care with the balloon squares to makes sure the color placement was random, and then I stitched the whole background together. I had wanted to the house to look more true to the the style of the house in the movie. 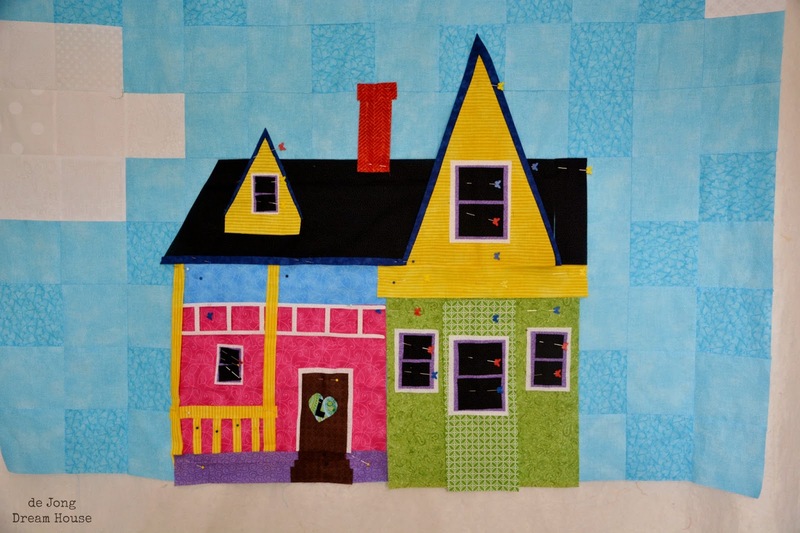 This was by far the hardest part for me because I didn't have a pattern or template to go from, just a blown up image of the house that I had made by layering shapes in PowerPoint. 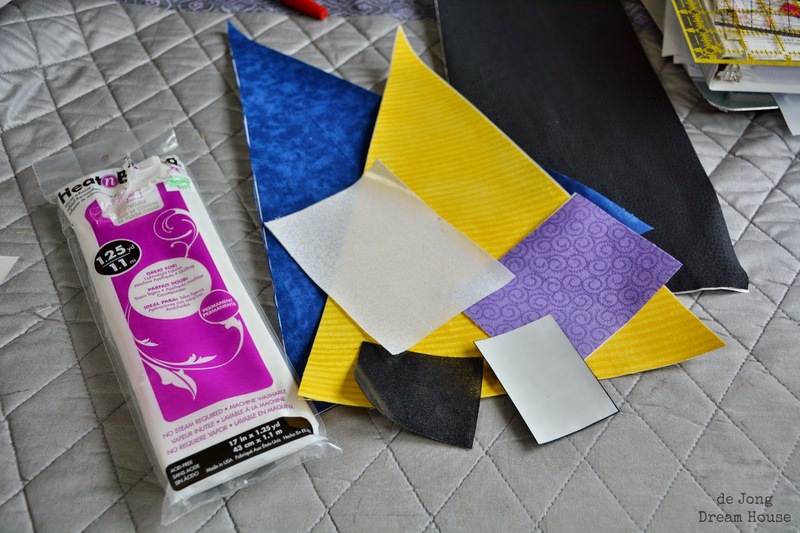 For the most part, I was still happy with my fabric choices after all these months. 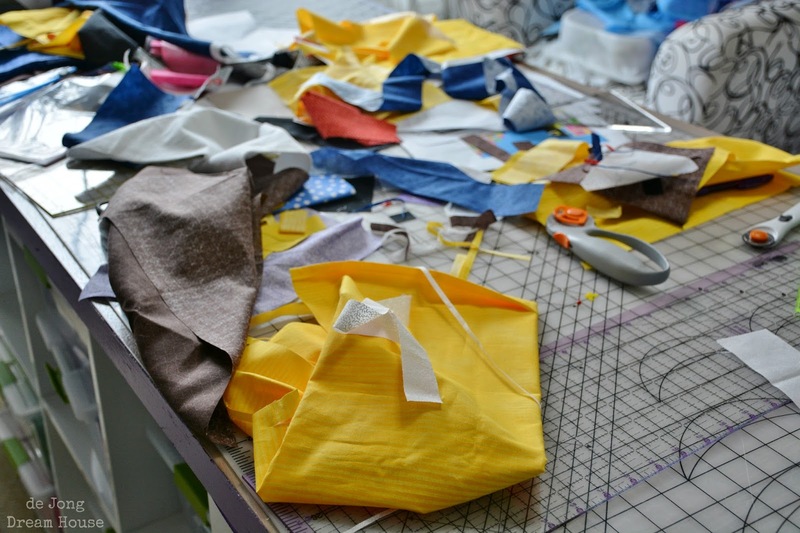 I used the squares of my nine-patches as an estimate for how large my applique pieces needed to be. I started with the large background pieces. 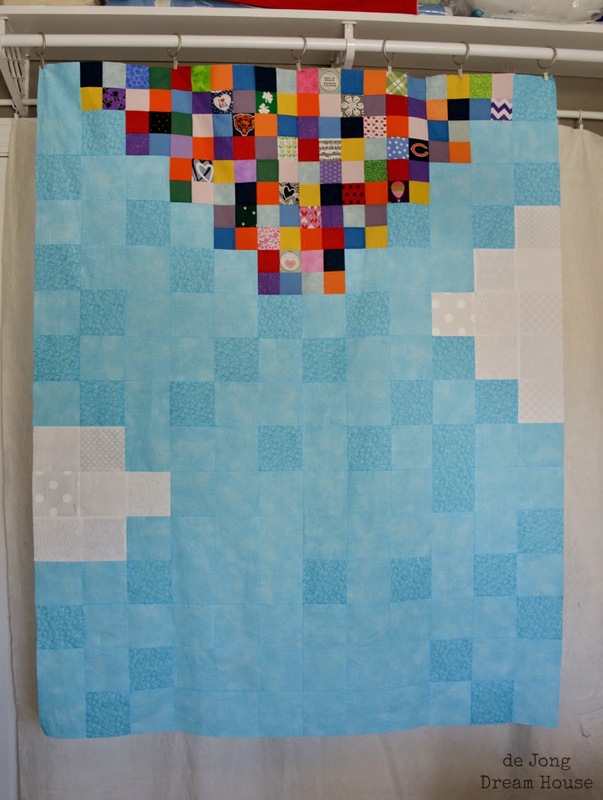 It looked good until I pinned the pieces to the quilt, so I systematically trimmed back all the pieces. Not only did I have to see how the sizes worked together, but i also had to play with some of the fabric choices. 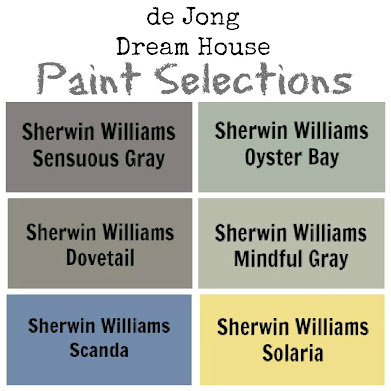 The original dark green i picked was too green, so I had to swap it out for something lighter. 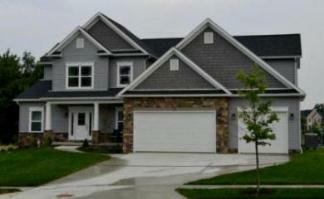 The dormers were tricky because I had to guess on the angles, and math was never my strong suit in school. Once I was happy with a shape, I re-cut it as a single piece. 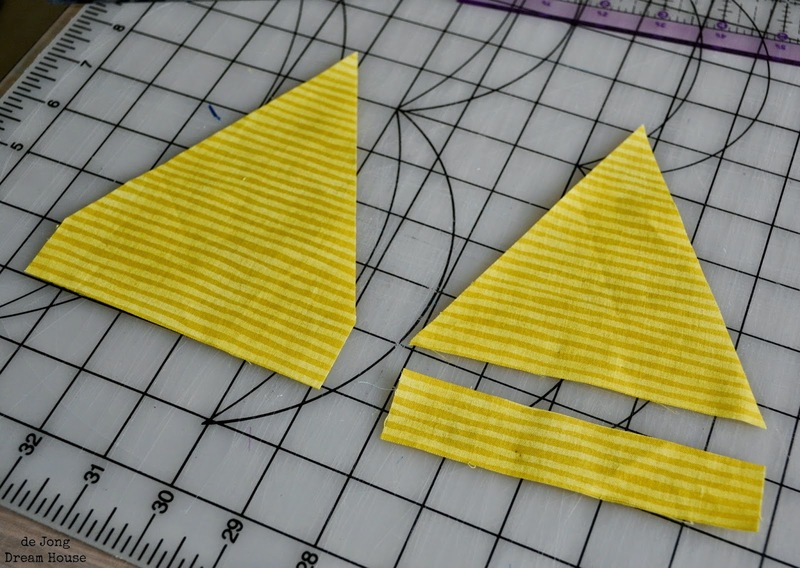 I was using raw edge applique so I wanted as many seamless joints as possible. It took two full days, but I finally had everything the way I wanted it. If anyone would like to try to replicate the house, these are the shapes I cut. Please note that these are the final tweaked sizes and may not look exactly like the in-progress photos. One triangle 9.5" wide at the base and 13" tall. The sides should measure 13.75" long. One rectangle 13" x 2"
One triangle 4.75" wide at the base and 5" tall. Sides should measure 5.5" long. Two rectangles 11" x .75"
One rectangle 7" x .75"
Four rectangles 2.5" x .5"
One rectangle 10" wide at the base and 14.5" tall. The sides should measure 15.5" long. One rectangle 5" wide at the base and 5.5" tall. The sides should measure 6" long. One rectangle 15.5" x .5"
One rectangle 1" x .5"
One rectangle 13.5" x 3"
One rectangle 13.5" x 10"
One rectangle 26"" x 6.5". Mark a spot on the top of the rectangle that is 22" from the right side. Place one end of your ruler at the 22" mark and one end at the bottom left corner. Cut off the outer left piece. Four rectangles 2" x 2.75"
Four rectangles 1.5" x 1.75"
Four rectangles 1" x 1.25"
One rectangle 5.25" x 3.5"
Two rectangles 5" x 3.75"
Two rectangles 4" x 2.75"
Two rectangles 2.5" x 1.75"
For the ladder like trim, I bought a ladder shape from Silhouette and stretched to to 13.5"
One rectangle 13.5" x 2"
Two rectangles 4.5" x 3.25"
Two rectangles 3.5" x 2.25"
One square 12" x 12"
Two rectangles 12" x 5.5"
One rectangle 5" x 1.75"
One rectangle 2" x 1"
One rectangle 5" x 3"
One rectangle 3" x 1"
One rectangle 4" x 1"
The next order of business was to clean up my cutting table, which looked like this! 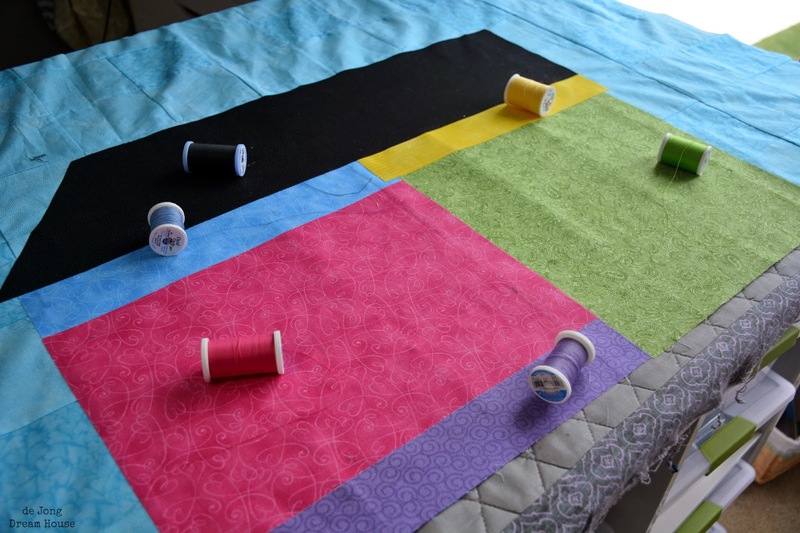 One of the reasons I enjoy quilting is that I am always learning something new. I used Heat N Bond, which I love. 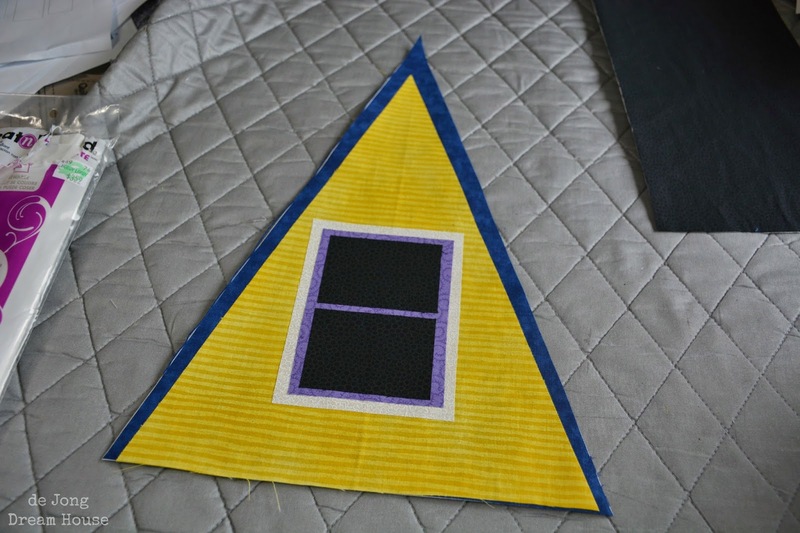 However, because some parts of the house were four layers of applique thick, it made the quilt a little cardboardy in places. 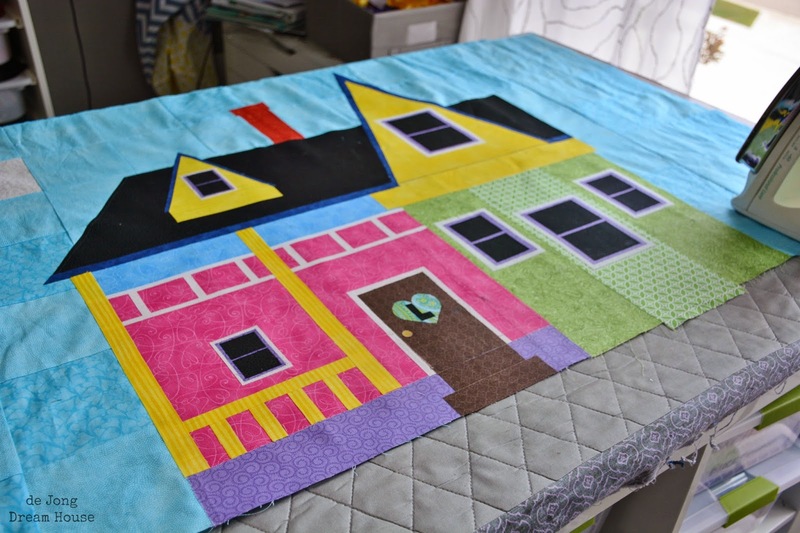 If I were to make another quilt like this, I would use basting spray to place the pieces and then immediately stitch to reinforce each piece. 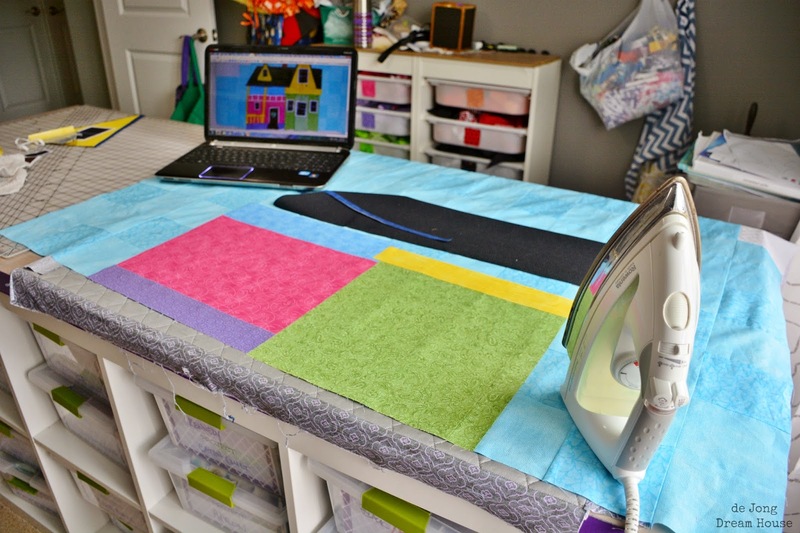 I think it would save time, and make for a more cuddly quilt. 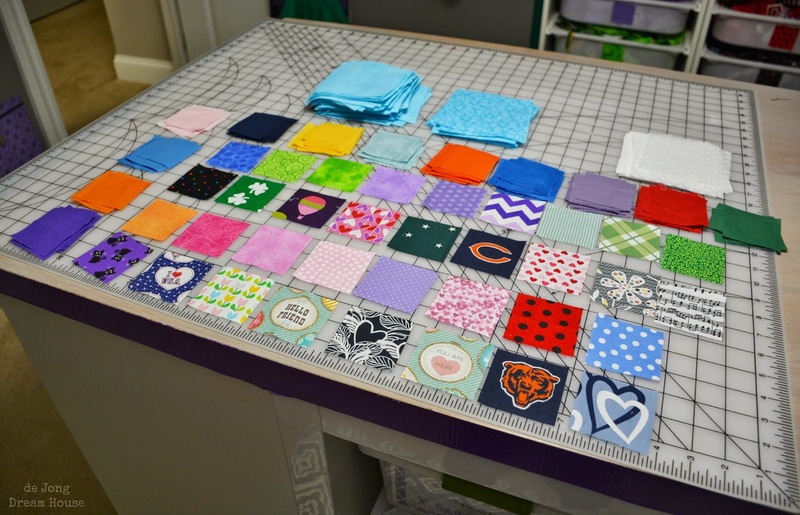 Once all the pieces were prepped, it was time for the scary part: praying that I fused the pieces correctly so I didn't have to repair or replace the background quilt! 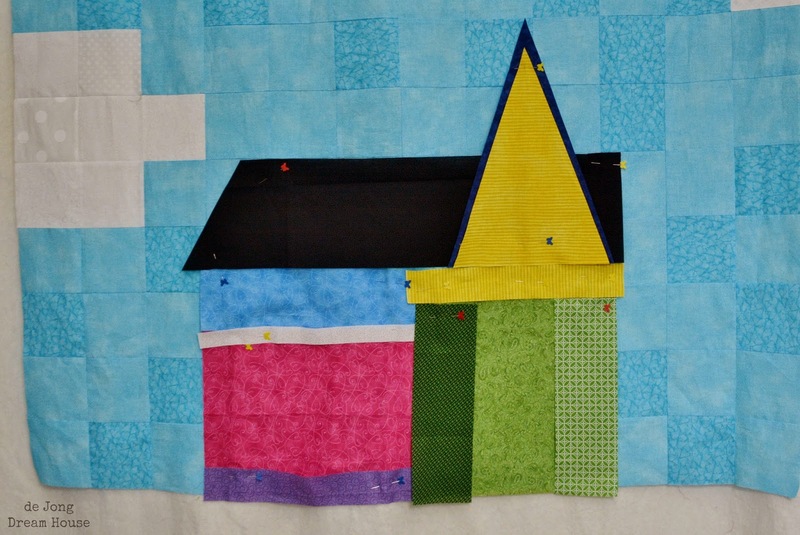 I started by layering the pieces that could later go on the quilt as one piece, like the windows on the dormers. I enlarged the picture of the house so I could carefully place all of the foundational (bottom) pieces of the house. Then I found matching thread colors to secure these pieces. At this point, I'm only confident in raw edge applique, so that's what I did, using a 1/8" seam. Once the first layer of applique was done, the rest went together pretty easily and I was breathing again! The next thing I did was add a few notes to a few of the balloons. 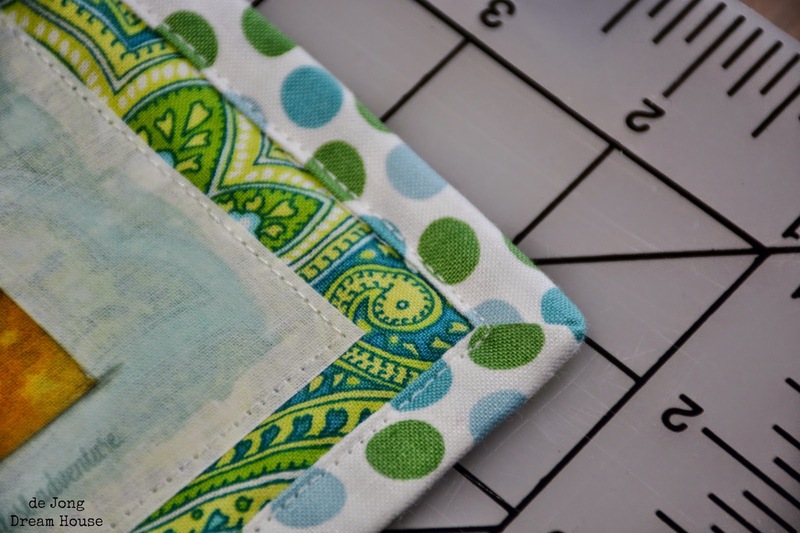 I learned a cool trick for using up scraps of my label fabric. I designed what I wanted each block to look like, and printed it. 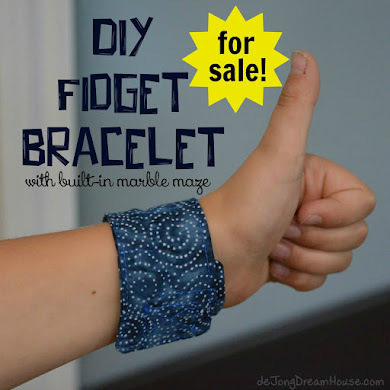 I then taped my scraps over the images and re-printed. I ironed on the dates and phrase, "It's beautiful here," a goose-bumpy nod to a dream a friend had the day after Bob died. 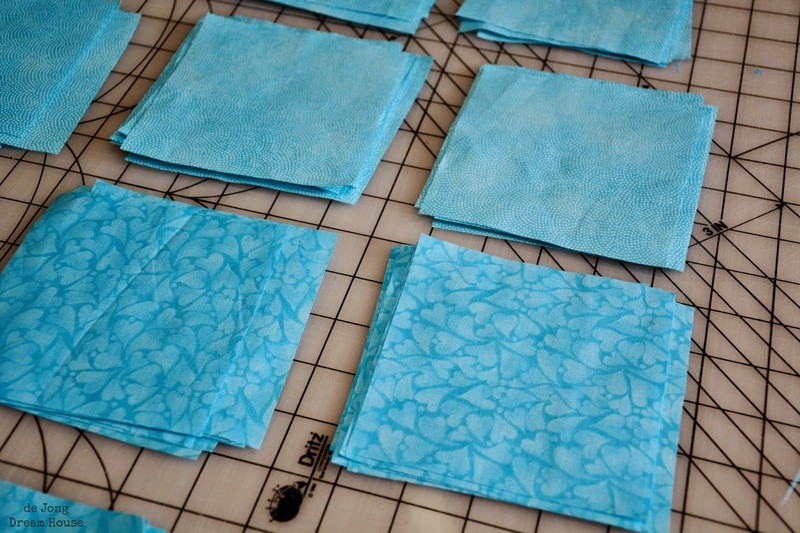 I added a 2" border using the backing fabric, and then a 3" border using the lesser-used blue cloud fabric. Finally, I added the balloon strings. I quilted them on only the top because the reverse side would have photos and I didn't want all those lines going through my friends' faces. Here is where I most appreciated my new Pfaff because I don't think my entry-model Singer would have done so well, especially because my first attempt with white thread wasn't dark enough and I had to do it again with dark thread. I used Viking purple. I think Bob would have gotten a kick out of that! At this point, I was starting to believe I could finish the quilt before we left for the funeral! 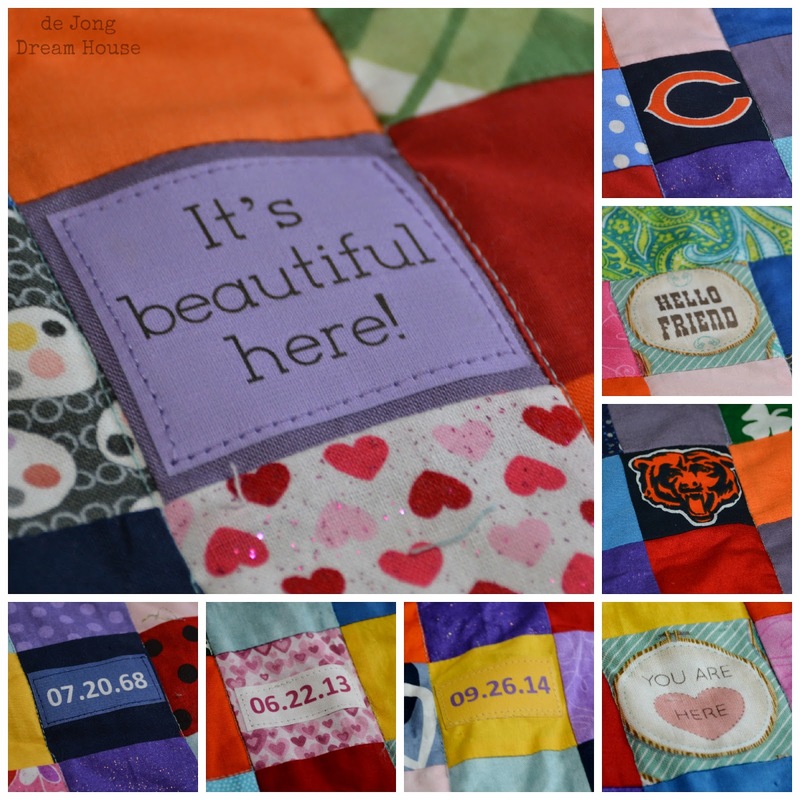 Because the quilt was now a memory quilt, I wanted to add some photos. 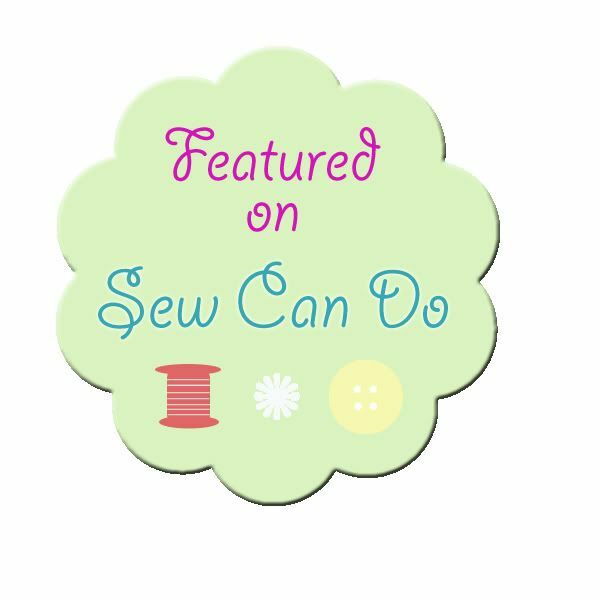 I used Drintz Sew-On Printable Fabric. 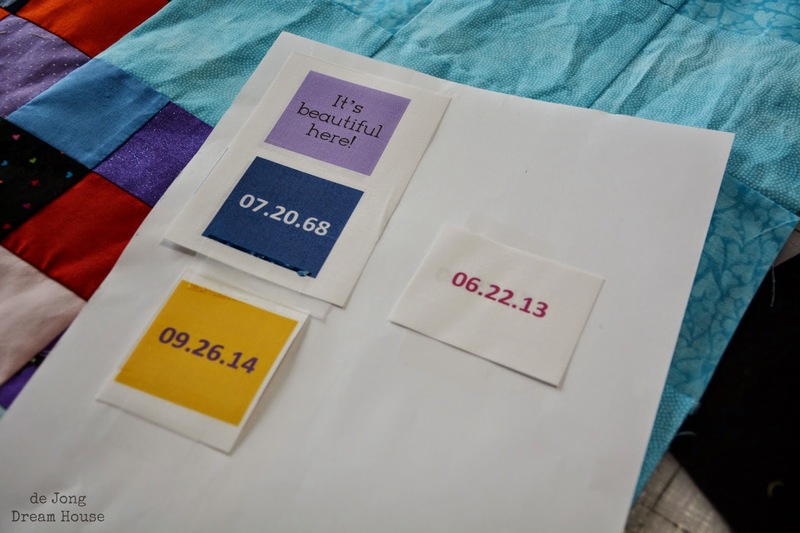 I learned my lesson from my Gramma's memory quilt and rinsed off the excess ink immediately after printing the photos. 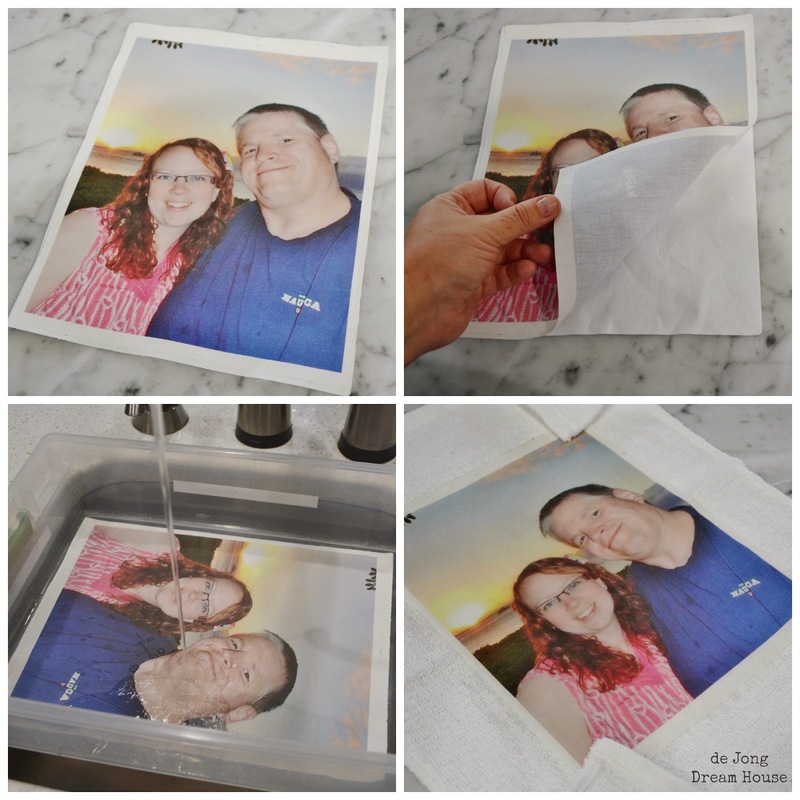 The photos were printed at 8" x 10" but were actually a little smaller due to the way the fabric took to the water. It took me a little while to figure out what size I needed the sashing to be. 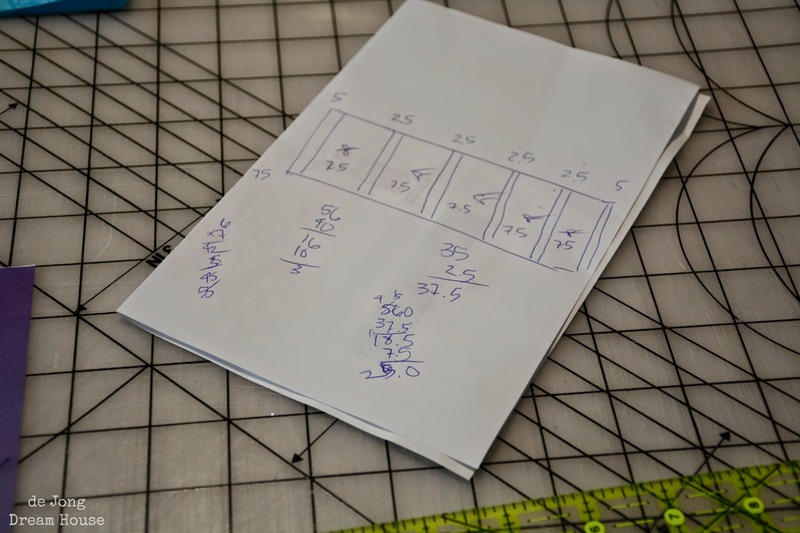 I never realized quilting required so much math! 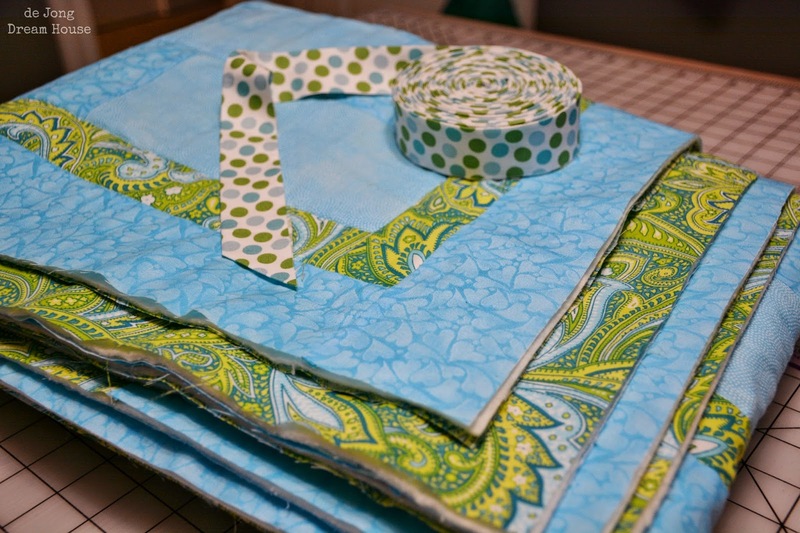 (For the record, I need 3" strips of sashing in the middle and 5.5" sashing on the ends). My son got a lot of free tech time at the end of the week as I worked feverishly to finish! 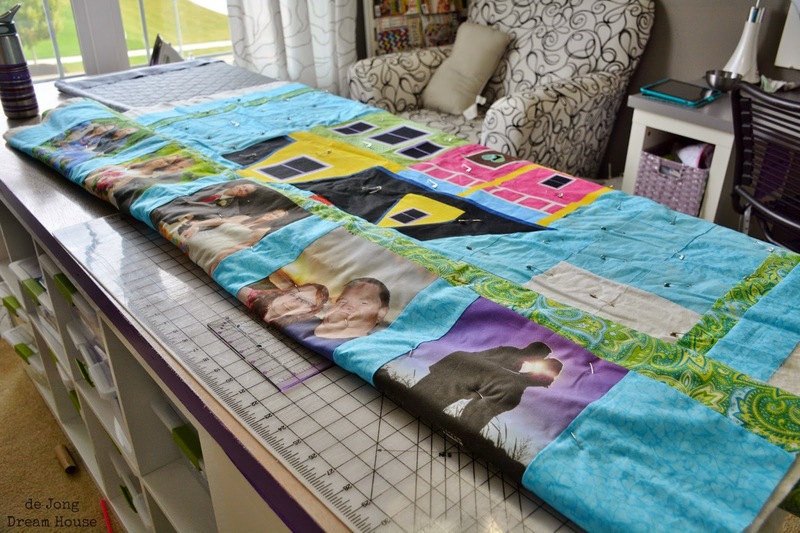 Making my quilt sandwich was a little challenging because I needed to line up the photos on the back with the blocks on the front. I taped chopsticks to the center image before securing it to my table. 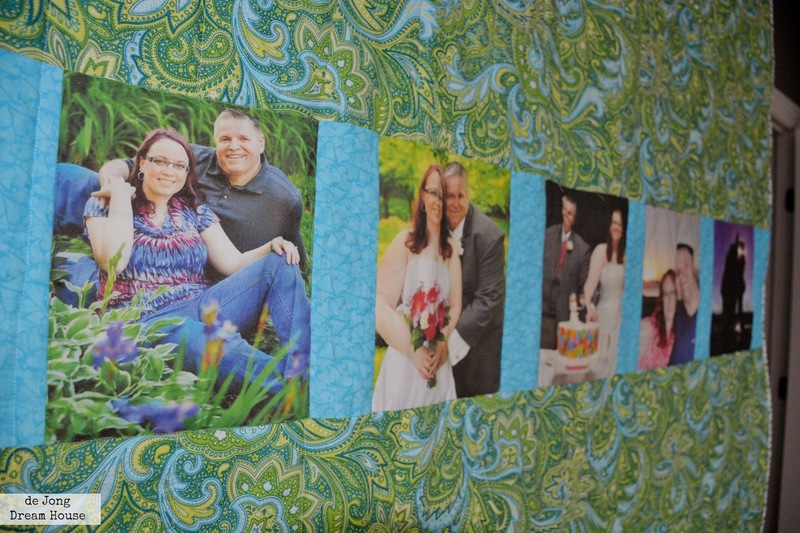 I started quilting by stitching in the ditch around the photos on the back. Then I turned it over stitched in the ditch around the sky, clouds, and balloons, while avoiding the photo area on the back. I watched the movie, "UP" to spur me on. I decided to work through the night rather than wake up early and risk not quite finishing. 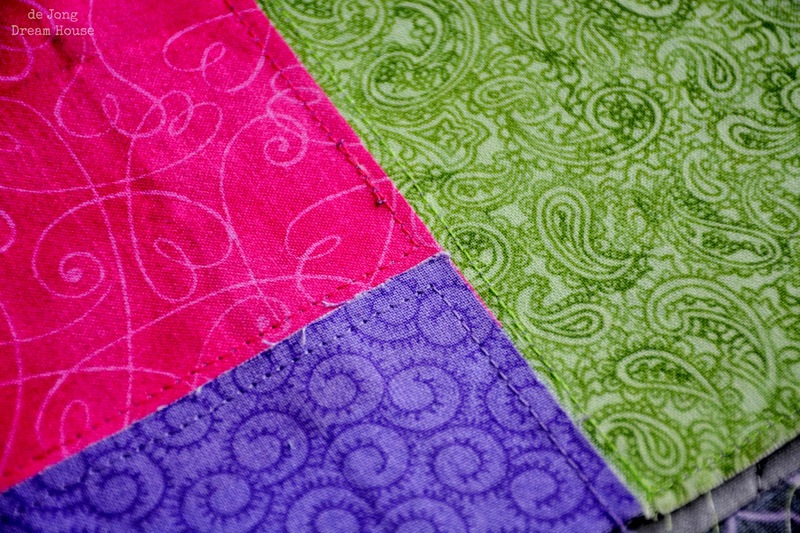 I had this polka dot fabric planned for another quilt, but it tied the colors together so well, I had to use it. Plus, the polka dots reminded me of balloons. There may be something to this middle-of-the-night work. This was my best binding yet! At last, it was time for the label. I knew I had to incorporate an image from the movie. I just love this image from Society 6. And at 4:25am, eight hours before our departure, the quilt was done! 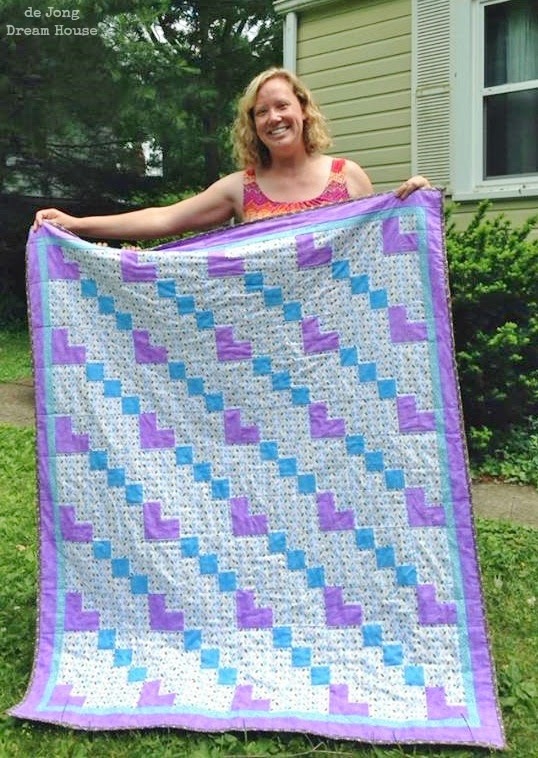 Only God could have given me the endurance to create this entire quilt in a week! 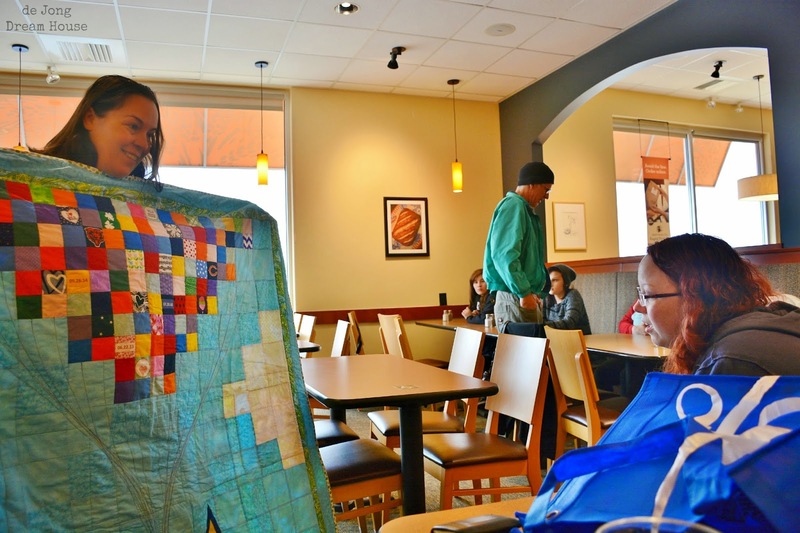 We met up with Erin the day before the funeral to deliver the quilt. Such a special moment, and I'm grateful Niels snapped this photo. 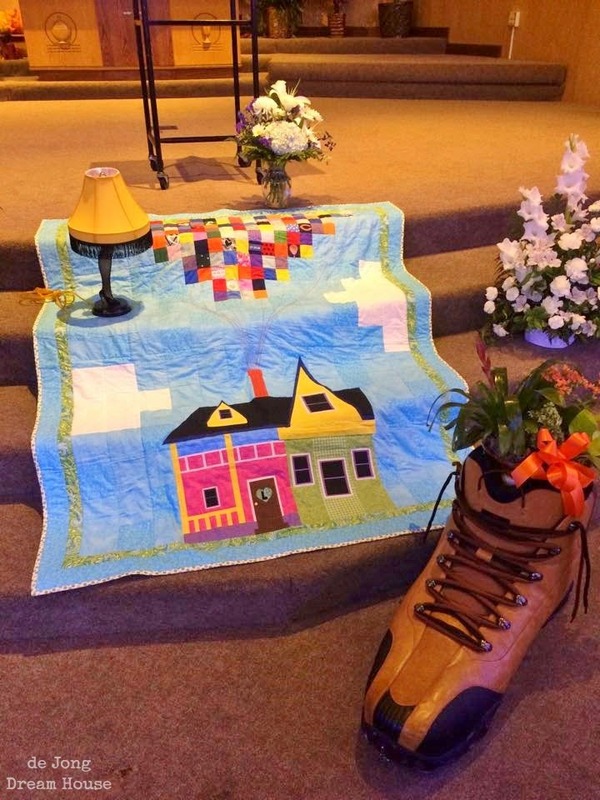 The next day, my waterfall of tears started as soon as I saw that Erin placed the quilt on the steps of the sanctuary. You can tell from this photo that Bob was a fun-loving guy, and I am so grateful to him for all the love and devotion he showered upon my friend. I only wish they could have had more time together. As we were headed home, Erin sent me this picture. thank you for sharing this beautiful love story. love between hsb and wife that was cut so short and love of old friends. the quilt is beautiful. What an incredible, thoughtful gift. I'm sure your friend will treasure it for many years to come. This is so creative, and what a wonderful gift! I'm so sorry for your friend's loss. Gecondoleerd met het verlies van Bob. 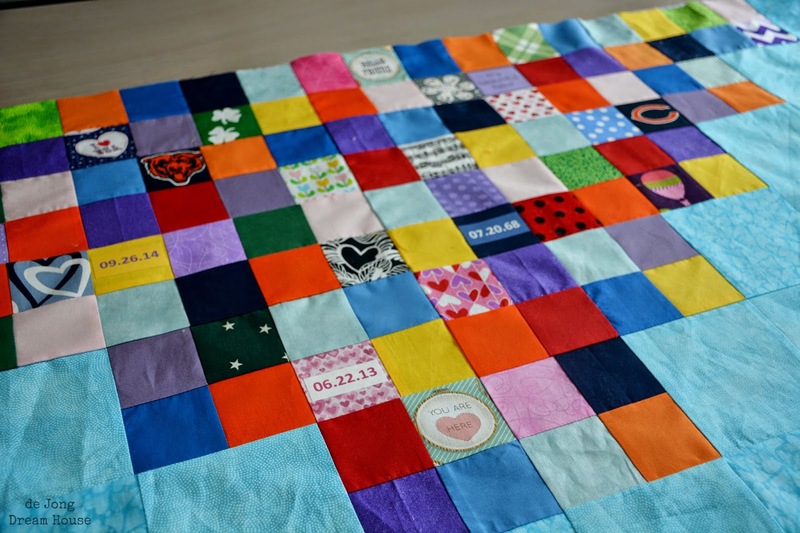 Wat lief van je om zo'n mooie quilt te maken voor je vriendin. Ik ddenk dat ze er veel troost aan heeft. Aan de quilt en aan jullie vriendschap. Een warme groet uit Amsterdam. What a beautiful, meaningful gift. It's so sad to hear of her loss. She is truly blessed to have a friend like you and such a wonderful keepsake. Thanks so much for sharing this! 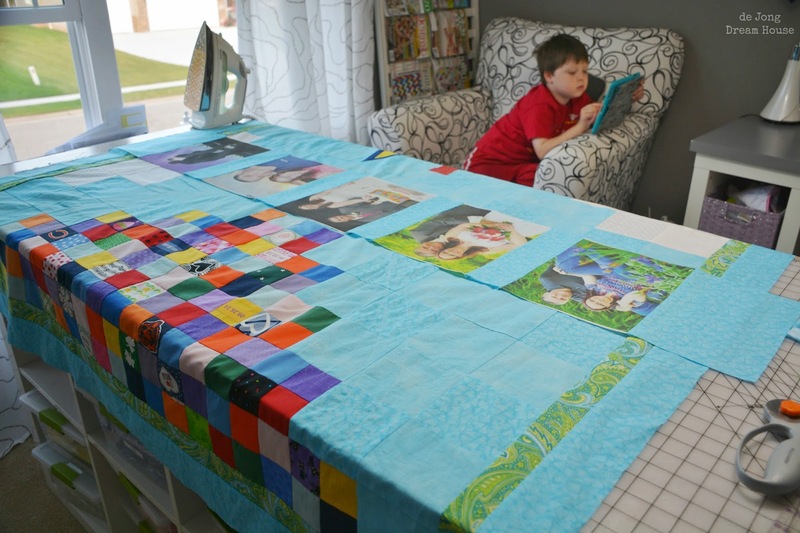 such a great story for an awesome quilt! 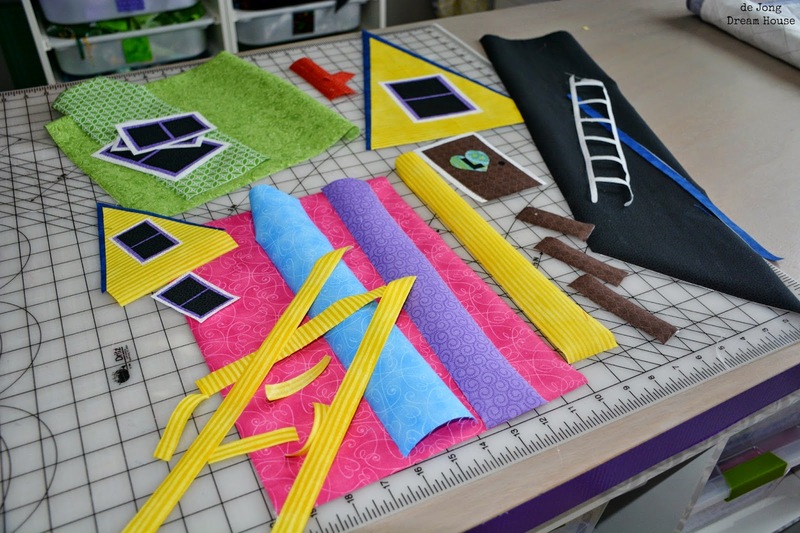 love all the colors and the step by step instructions! 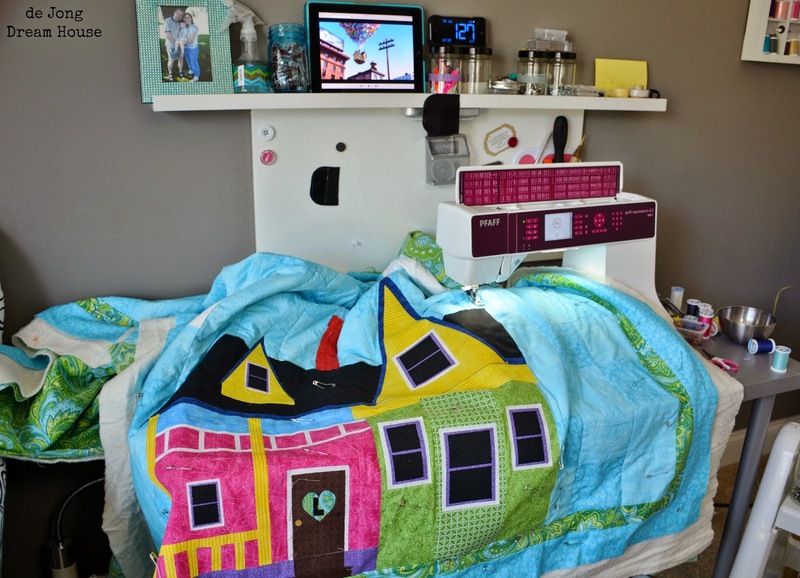 Thanks for sharing the story behind such a beautiful quilt. I'm sure you're friend will treasure it for many years to come. What a beautiful tribute for your friend. 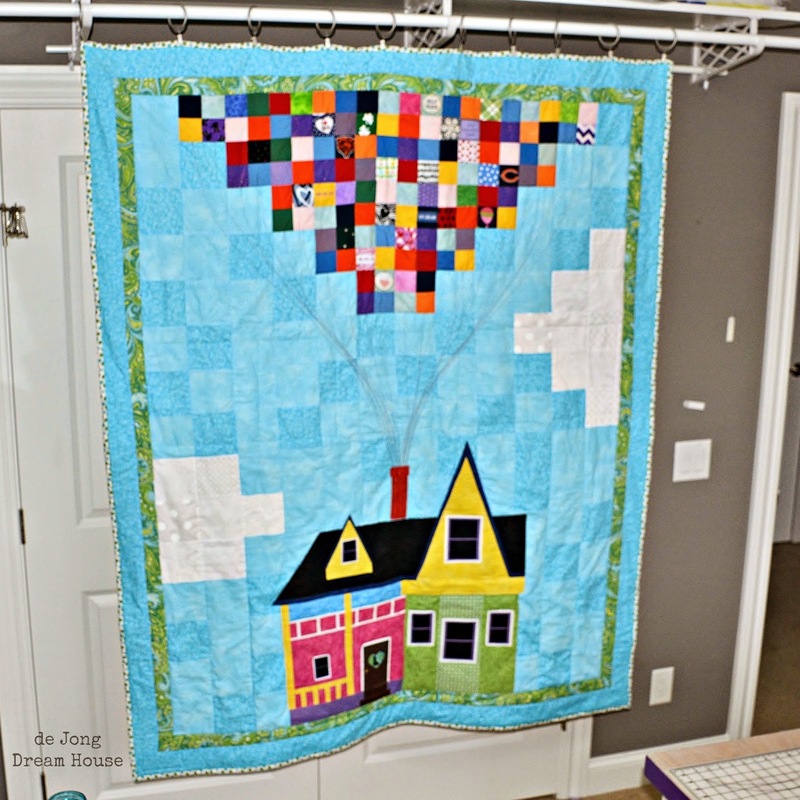 It's a beautiful quilt, and the story and meaning behind it are so lovely. I'm sure it will bring her much comfort. What a beautiful story, so sorry about your friend's loss. 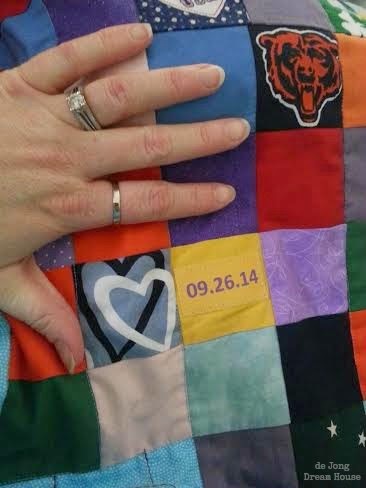 The quilt did turn out great and what a great reminder for her to have something to cuddle in when sad. This is such an amazing quilt. I love it so much. What a lovely story behind it as well. I would love to do something similar to this for my brother-in-law and sister-in-law. Oh, wow! The story. The quilt. The love!! You are a wonderful friend, Jen. Not nearly as good in real life as I'd like to be, but I really do try to show my love in my stitches.